November 17, 1993 marked the official opening of the Legislative Assembly building, the first permanent home for the government of the Northwest Territories. 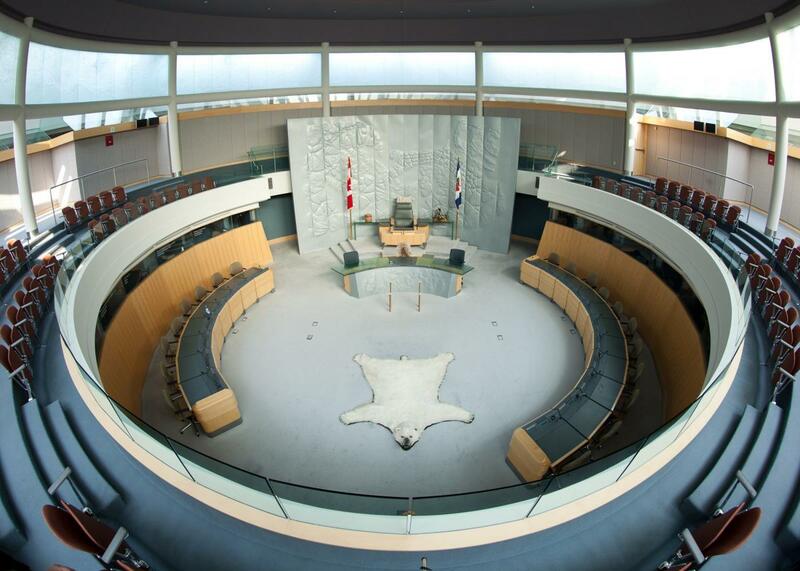 Located in a natural setting on the shores of Frame Lake, the Legislative Assembly building is just a short walk from downtown Yellowknife. Members of the Legislative Assembly, who are elected by NWT residents from 19 electoral districts or constituencies, carry out the territorial government’s business on behalf of its northern citizens at the Legislative Assembly building. Territorial architects Ferguson Simek Clark and Pin Matthews, in association with Matsuzaki Wright Architects Inc. of Vancouver, designed the 46,000-square-foot building. During construction, begun in 1990, emphasis was placed on maintaining the natural landscape surrounding the building, including the trees, rock outcrops, and the lakeshore. The Capital Site area encompasses a variety of northern ecosystems, including a large, expansive peat bog abundant with native wildflowers, grasses, birds and waterfowl situated in the foreground to the Legislative Assembly Building. Black spruce, tamarack, and white birch trees flourish beside the walkway leading to the building’s entrance. To the west and north of the legislature, precambrian shield meets the edge of Frame Lake. Small mammals, birds, and waterfowl inhabit this area, much as they did before the building was constructed. Zinc was selected as a primary construction element for the Assembly because of its subtle weathering qualities, and importantly, because it is mined in the North. The walls are clad in both sheet and cast zinc panels, lightly tinted with green glazing. Zinc shingles cover the domed roofs and form the undulating roof edge. Zinc louvers with operable panels provide natural ventilation to each office within the legislative building. The building is anchored to the ground by a wall of indigenous stone. As visitors enter the Legislative Assembly, they are immediately welcomed into the Great Hall with its spacious public meeting area accentuated by a wall of windows. From here, visitors enjoy a view of Yellowknife's downtown or catch a glimpse into the Chamber. The Chamber is at the heart of the building, which from the outside is announced by a shallow dome floating over adjacent treetops. Its circular shape represents both the cultural traditions of northern Aboriginal people and the Territory’s unique form of consensus government. As well, Members’ desks are arranged in a circle around the Speaker’s chair, symbolizing a unity of purpose. The design counters the typical appearance of many legislatur es where opposing benches are distanced two sword length apart. Aboriginal artwork and a polar bear hide rug adorn the Chamber. The translucent glass frieze diffusing natural light as it enters the Chamber was designed and crafted by Warren Carther, an internationally recognized glass artist from Winnipeg. The Caucus meeting room with its unique acoustic qualities has space for a full seating of 19 MLAs, and contains a treasured collection of A.Y. Jackson landscape paintings and the large collage-style paintings of Graham Shaw. Offices for Members and Assembly staff radiate out from the Chamber and Caucus room, and each has a distinct view of Frame Lake and surrounding forest. There are also meeting rooms and public spaces used to facilitate contact between MLAs and their constituents, territorial organizations, and the people of the NWT. 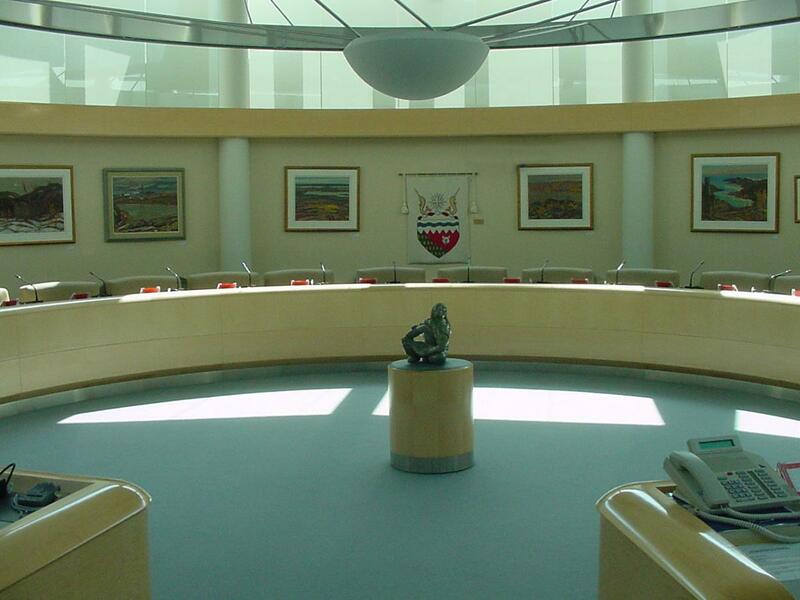 The Speaker of the Legislative Assembly has the only office with a view of the City of Yellowknife, which symbolizes the Speaker’s key leadership role as the person who welcomes dignitaries and visitors to the capital city and to the Assembly.